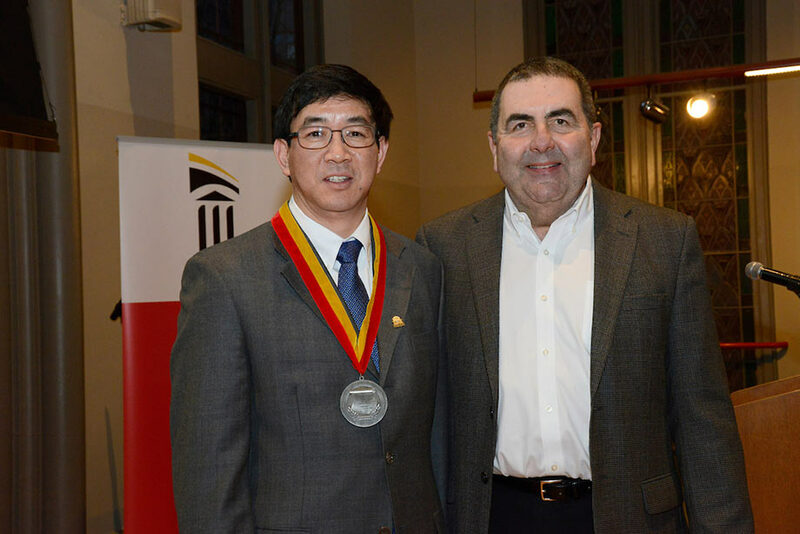 26 years after coming to the United States from a remote area in Southwest China, Zhongjun Jon Wu, PhD, has become one of the leading bioengineering scientists, and he has earned his place among top faculty at the University of Maryland School of Maryland School of Medicine (UMSOM). On March 1, he was invested at Westminster Hall as the Peter G. Angelos Distinguished Professor in Entrepreneurial Surgical Sciences. 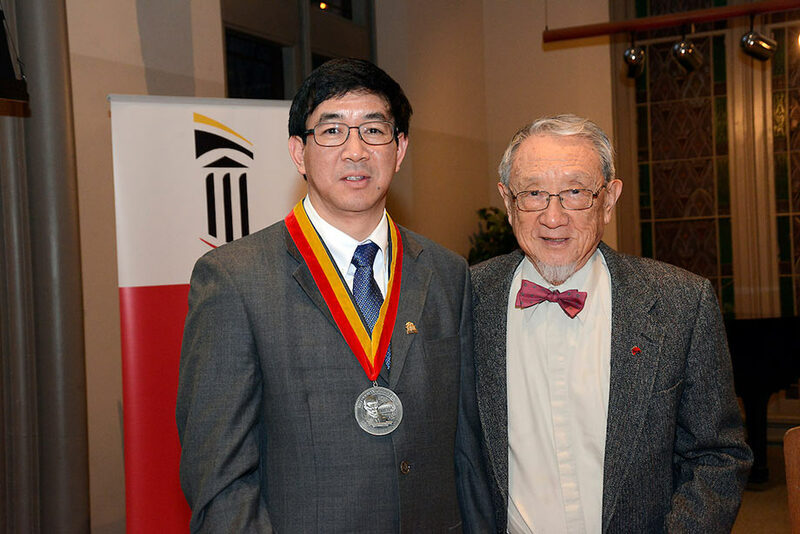 “I am so honored and so humbled, to receive this prestigious endowment,” Dr. Wu said. 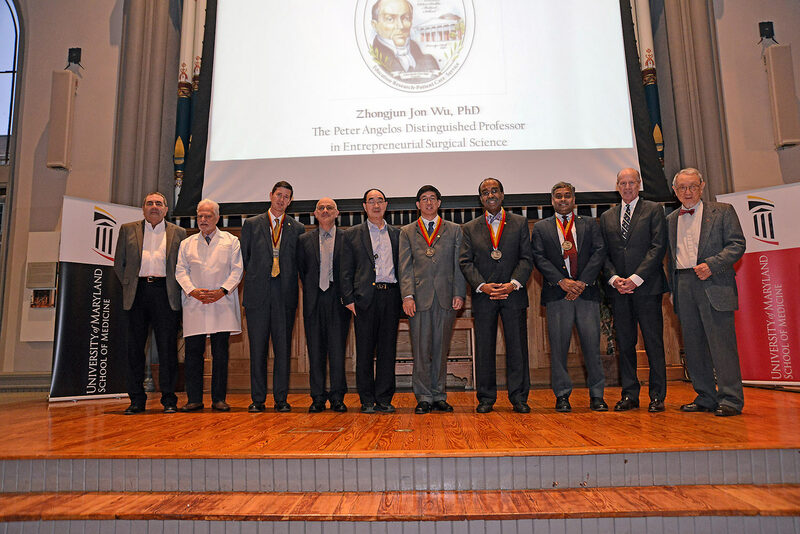 Other speakers at the ceremony included: William J. Federspiel, PhD, the William Kepler Whiteford Professor, Department of Bioengineering, Director, Medical Devices Laboratory, McGowan Institute of Regenerative Medicine, University of Pittsburgh; and Ned Hwang, PhD, the James L. Knight Professor of Biomedical Engineering Emeritus, University of Miami. 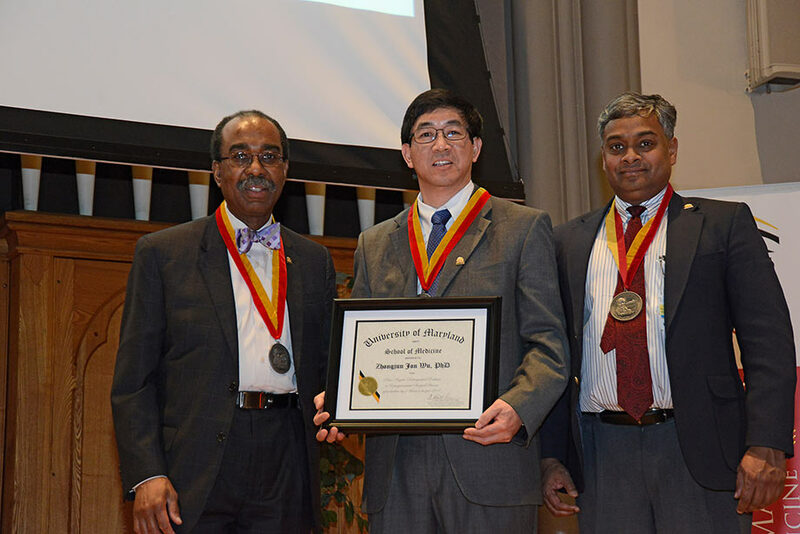 “The honor associated with the appointment to an endowed position has remained unchanged for the last 500 years and is recognized as one of the highest tributes that an institution can bestow upon its most distinguished faculty,” said E. Albert Reece, MD, PhD, MBA, Executive Vice President for Medical Affairs, UM Baltimore, John Z. and Akiko K. Bowers Distinguished Professor, Dean, University of Maryland School of Medicine. “Endowed professorships, including the new Peter Angelos Distinguished Professor, provide our excellent faculty members with critical resources needed to sustain and expand promising research, launch innovative clinical initiatives, and educate and train the physician-scientists of tomorrow.” Deen Reece highlighted that UMSOM is fortunate to have nearly 70 endowed chairs and professorships in various stages of completion. Joining Dean Reece in presenting the John B. Davidge Medal was Rajabrata Sarkar, MD, PhD, the Barbara Baur Dunlap Professor in Surgery. Dr. Wu began his career at the University of Miami, where he received his PhD in biomedical engineering in 1996. He was recruited Department of Surgery at UMSOM as an assistant professor from the University of Pittsburgh in 2003, when he founded the Artificial Organs Laboratory. 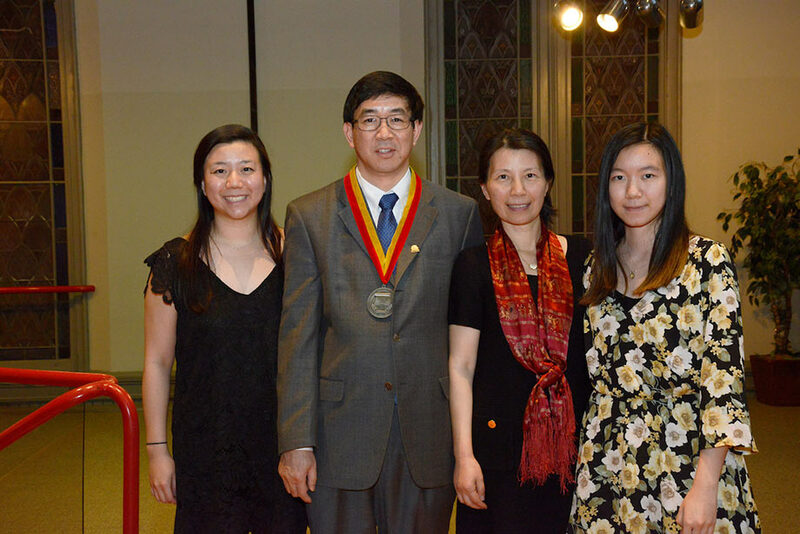 Dr. Wu was promoted to full professor in July 2014. Dr. Wu is currently engaged in the basic and applied research of cardiovascular and pulmonary disease and the fundamental technical problems associated with artificial and bio-hybrid organ development. Dr. Wu’s current research projects include the use of ventricular assist devices in heart failure, development of pediatric ventricular assist devices, development of artificial pumping lungs, computational design and modeling of biomedical devices, experimental study and computational modeling of blood damage, and stem cell-based cellular therapy for cardiovascular disease and pulmonary disease. “It’s definitely a team effort,” says Sara S. Manetta, Class of 2020 MD candidate at the University of Maryland School of Medicine (UMSOM). “We’re all hands on deck all of the time!” Manetta is speaking about the flurry of activity surrounding preparations for the Annual Second Year Medical Student Auction, which will be held Thursday, February 22, 2018, from 5:30 to 7:30 pm at the Southern Management Corporation (SMC) Campus Center, 621 W. Lombard Street, Baltimore, MD 21201. This event is open to parents, students, faculty, and staff.